See the new abstract on a multicenter, randomized, crossover trial: Comparison of linked color imaging and white-light colonoscopy for detection of colorectal polyps. See the new abstract on how Linked-color imaging improves endoscopic visibility of colorectal nongranular flat lesions. Endoscopy Issue 5, 2017 by Thieme Verlag. Copyright Thieme Verlagsgruppe. structure with BLI will be discussed. Join the meeting at the Paracelsus Medical University on June, 2nd, 2017. Join the symposium “Thinner and Clearer – Advances in Nasoendoscopy and GI Tract Lesion Recognition” during Endolive UK with Dr. Ed Despott – Royal Free London Hospitals NHS Foundation Trust and Prof. Raf Bisschops – University of Leuven as speakers. Discuss how dramatically improved optics, smaller scope diameters and new advanced imaging modalities are set to change the endoscopy landscape as it is known. Advanced imaging technology is providing endoscopists with the capability to push currently accepted boundaries of flexible endoscopy into new and uncharted territory. Come together for an informative and interactive session discussing how these advances can help to improve and streamline practice on Thurday, March, 2nd at 13:35 to 14:05 h in Hall 3 at the ICC, Birmingham. The latest innovations with regards to imaging technology open new doors to improve detection and characterisation in your daily procedures. The aims of the following two intensive workshops are to maintain and improve GI endoscopic skills especially for advanced imaging techniques in combination with advanced endoscopic techniques such as ESD and to gain practical experiences. There will be a combination of interesting lectures explaining the different techniques showing examples of daily practice combined with a series of live procedures and hands-on training under the expert guidance of Prof. Dr. Helmut Neumann. Limited number of places are available to maintain the best quality of the workshop. The participation fee is 340 euros excluding travel and hotel accommodation. See the new abstract on the advantages of BLI concerning the adenoma miss rate. 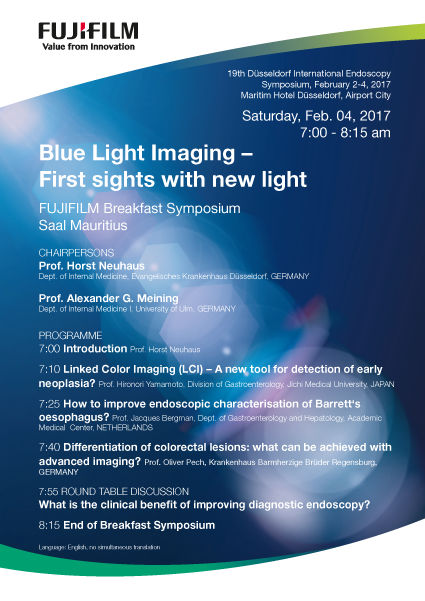 It is a pleasure to invite you to our FUJIFILM Breakfast Symposium „ Blue Light Imaging- First sights with new light “ as part of the 19th Düsseldorf International Endoscopy Symposium. Leading experts in the gastroenterology field will give insights about their experience with advanced imaging. Afterwards you are welcome to take part at a round table discussion elucidating the benefits of improving diagnostic endoscopy. The Symposium will be held in english. 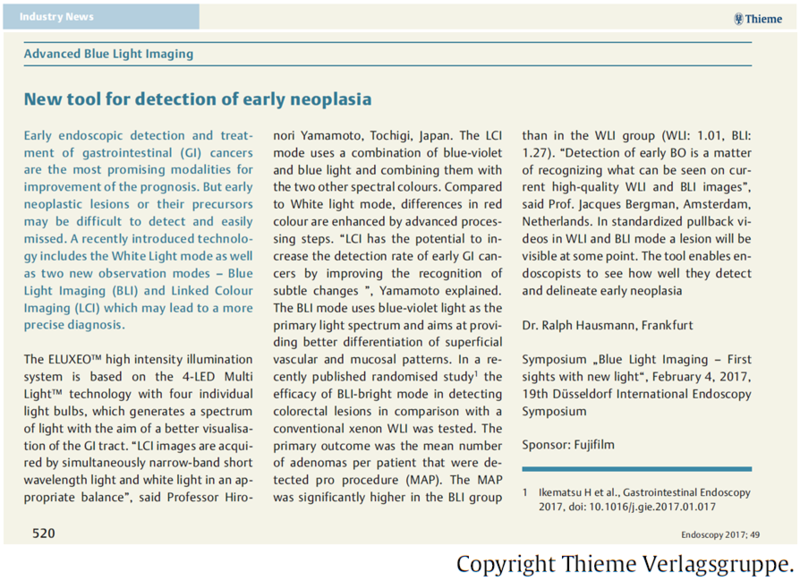 Welcome to the new scientific portal about Blue Light Imaging (BLI). We are happy to provide you with background information and latest news concerning the BLI technology. Read or listen to experts’ experiences or receive impressions of BLI imagery yourself by looking through our comprehensive Media Gallery. Be informed about upcoming congresses and training workshops using BLI technology European wide. If you would like to receive further information or get the latest news please register to our portal or sign up for the newsletter.